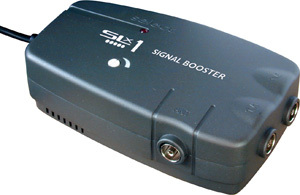 SLX 2 Way Distribution Amplifier / Booster with digital Bypass . Built-in digital bypass for use with Sky remote extenders. 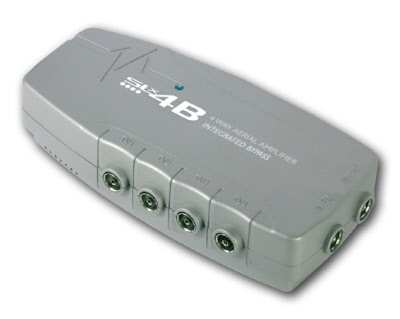 Fixed gain, plug-in, signal amplifiers for use with TV, FM and Digital (DAB) Radios, when fed from a suitable aerial. 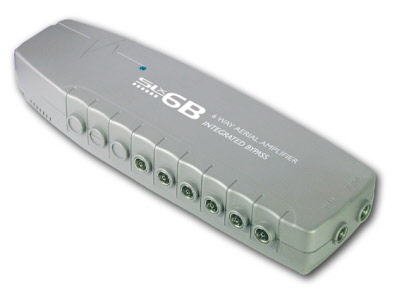 The amplifiers can also be used to link a satellite decoder to a TV and/or a video recorder. These units are housed in an attractively styled box fitted with mains lead for plugging directly into a 13A socket. 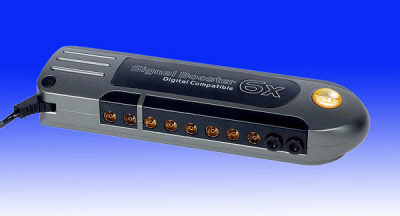 Unlike most on the market these amplifiers have a digital bypass built-in. If you are using a Sky remote control extender , regular amplifiers prevent them from working. 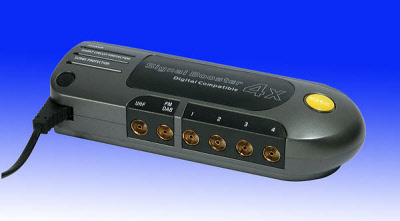 SLX 4 Way Distribution Amplifier / Booster with digital Bypass . Built-in digital bypass for use with Sky remote extenders. 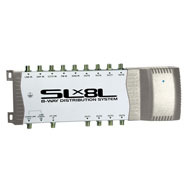 SLX 6 Way Distribution Amplifier / Booster with digital Bypass . Built-in digital bypass for use with Sky remote extenders. SLX 8 Way Distribution Amplifier / Booster with digital Bypass . Built-in digital bypass for use with Sky remote extenders. This product is designed specifically to boost digital TV (Freeview) signals in poor coverage areas. Using a medium gain amp with low noise this unit is very effective at improving the picture stability and reliability in weak signal locations. This is an ultra-wide band FM/UHF distribution amplifier for small domestic systems. It features high gain, exceptional output capability and separate FM/UHF aerial input sockets. These inputs are combined and distributed to all 6 outputs. Where any of these outlets are intended for a TV and radio, it is recommended that you use a diplexing outlet. The amplifier also features an automatic line-power facility which will deliver 12Vdc to the UHF input when it detects the presence of a masthead amplifier. 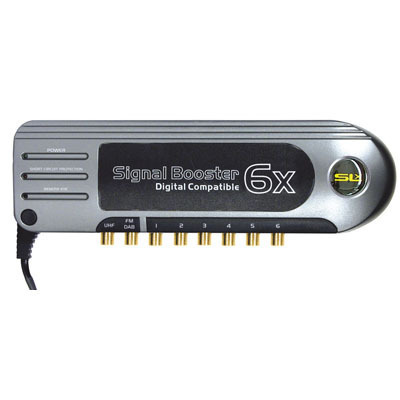 Excellent value and performance Digital compatible signal amplifiers to distribute and amplify signals around the home. • Allows the distribution of FM radio, DAB radio, CCTV, VCR, satellite and terrestrial TV signals to 8 televisions/radios around the home from one location (e.g. loft). • Combines TV, FM, DAB, CCTV & satellite signals on to one down cable feeding triplexed faceplate located near main AV equipment location (e.g. living room). • Return cable from VCR/satellite box to loft box feeds 8 other viewing locations around home with AV signals. • Infra-red extender feature gives control different AV sources from any viewing/listening location in conjunction with SLx Link(s). 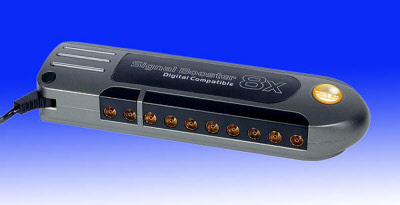 • Integrated digital bypass - infra-red extender works in conjunction with Sky digital feature. • Stylish blue LNB power indicator and silver-grey metallic finish. • Fully screened, ideal for digital satellite. 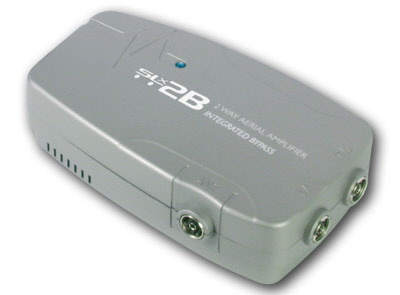 Global F120 - 2 way amplifier enables use of 2 TV links. 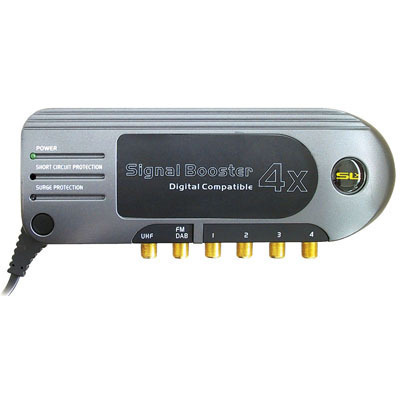 No mains connection is required as it receives the power from the RF2 of your digibox. The F Series TV booster/splitters are designed to amplify the UHF (TV) or FM (Radio) signals in a poor signal area or to distribute the TV signals around the house. Typically these amplifers are installed in the loft or next to the signal source, e.g. Sky or Freeview receiver. 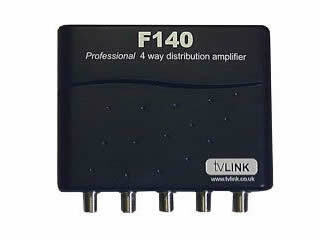 Global F140 - 4 way amplifier enables use of up to 4 TV links. 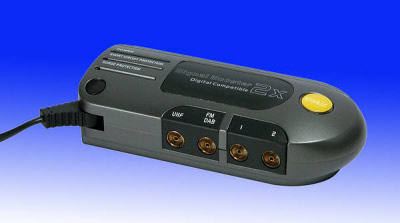 No mains connection is required as it receives the power from the RF2 of your digibox. The F Series TV booster/splitters are designed to amplify the UHF (TV) or FM (Radio) signals in a poor signal area or to distribute the TV signals around the house. Typically these amplifers are installed in the loft or next to the signal source, e.g. Sky or Freeview receiver. 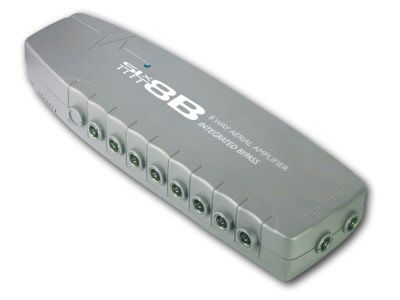 Global F180 - 8 way amplifier enables use of 8 TV links. Mains Power connection is included. The F Series TV booster/splitters are designed to amplify the UHF (TV) or FM (Radio) signals in a poor signal area or to distribute the TV signals around the house. Typically these amplifers are installed in the loft or next to the signal source, e.g. Sky or Freeview receiver. Global T120 - 2 way amplifier enables use of 2 TV links. No mains connection is required as it receives the power from the RF2 of your digibox. The T Series TV booster/splitters are designed to amplify the UHF (TV) or FM (Radio) signals in a poor signal area or to distribute the TV signals around the house. Typically these amplifers are installed in the loft or next to the signal source, e.g. Sky or Freeview receiver. 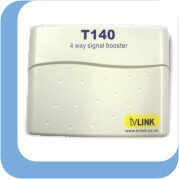 Global T140 - 4 way amplifier enables use of 4 TV links. No mains connection is required as it receives the power from the RF2 of your digibox. The T Series TV booster/splitters are designed to amplify the UHF (TV) or FM (Radio) signals in a poor signal area or to distribute the TV signals around the house. Typically these amplifers are installed in the loft or next to the signal source, e.g. Sky or Freeview receiver.